Tuesday, Aug. 21, 2018, 5 – 7:30 p.m.
Join us for this summer Husky Happy Hour and enjoy the spectacular view with a full-flavored beer and some great grub to go with it! The Hub in Gig Harbor features a warm and friendly atmosphere for families and visitors alike! 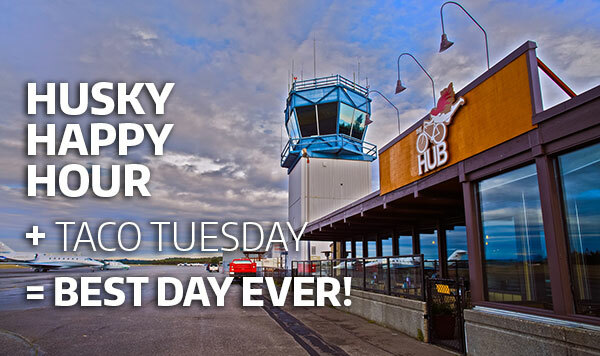 Located on the tarmac/runway of the Tacoma Narrows airport, The Hub offers unparalleled views of a working airport. An entertaining location paired with local Mediterranean flavors and handcrafted Harmon Brewing Company micro beers. This event is proudly hosted by the UW Tacoma Alumni Council. The event is free of charge, but registration is required. Register today for Huskies and Taco Tuesday @ The Hub Gig Harbor!